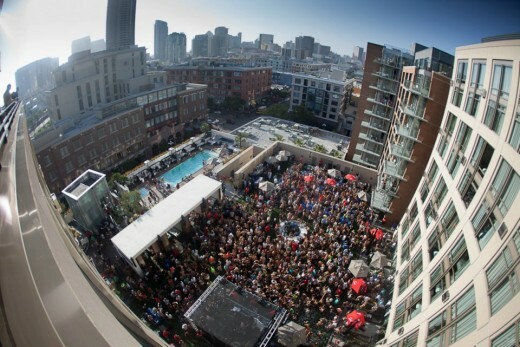 Summer is just around the corner and San Diego will be celebrating its launch over Memorial Day weekend with tons of fun pool parties, events, shows and headliners! Whether you want to lounge by the pool with hundreds of your closest friends, dance to your favorite DJ or get out on the Bay, this weekend is your opportunity to start this summer off right! Le Diner a San Diego @ ??? We know you love Flash Mobs, right? And you like to eat, yes? And what’s Memorial Day weekend without a White Party, huh? Well throw all those things together and you get San Diego’s Le Diner a San Diego on Friday night. Buy your seats to the event and you’ll get a message Friday morning with the details on where the event will be held that night. Tables and entertainment are provided, but you bring your food, friends and a good time! This concept was launched in Europe years ago and has finally made its way to San Diego. Don’t miss out on this fantastic event! Memorial Day weekend Intervention is twice as big as usual with headliners Lil John performing on Saturday and renowned DJ Steve Aoki spinning on Sunday. The Hard Rock’s weekly pool party extravaganza will be rocking Downtown all weekend long with these two huge acts – and you know Hard Rock likes to go BIG! The Ivy Rooftop is Fortune Industry’s summer spot for Sunday pool parties, and Memorial Day weekend kicks off the festivities with house music, dancing, fashion and an adult beverage or two! So pull out this season’s latest gear and party with Fortune at the Ivy Rooftop! For those fleeing downtown for the weekend, why not head to Cricket Wireless Amphitheater for the I Love This City San Diego Music Festival happening Sunday. With 21 musical acts performing – including well known artists Skrillex and Crystal Method – you know Chula Vista will be jumping on Sunday! The show is 16 and over and tickets start at $25. The Hornblower Inspiration will play host to the ultimate Yacht Party on Sunday starting at 3:30 pm. 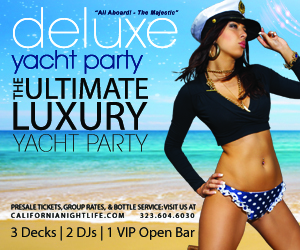 6 DJs will be rocking the boat all evening long while revelers enjoy the sights of San Diego’s amazing evening skyline. The 3.5 hour long party cruise will be sure to delight but make sure to buy your tickets soon. Golden Ticket prices start at $40 with special Platinum VIP tickets (which include access to the private Platinum VIP deck) starting at $85. The beauty of holiday weekends is that you can have your own backyard BBQ and still have the opportunity to hit up a giant pool party, watch your favorite DJ or musical act perform and still have a day to recover! So don’t let this weekend go to waste folks…get out there and party! 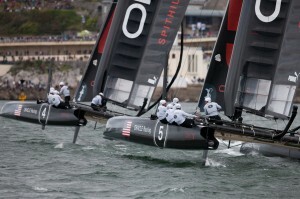 Coronado Sets Its Sights on America’s Cup World Series! Ahoy! The America’s Cup World Series is just around the corner, sailing into San Diego Bay – and into the history books – starting this Saturday, November 12 through the 20th. What makes these races so exciting is that it’ll be the first time the incredibly swift, state-of-the-art AC45 wing-sailed catamarans will be seen in the United States! They were specially designed to slice through the water at speeds up to 30 knots, promising spectators some serious thrills as the world’s top sailors push their boats to the limit (Translation: Yes, a few of these fast boats might capsize.). 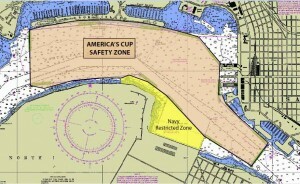 Since the Coast Guard is enforcing a Safety Zone taking up a large portion of the bay, viewing the races from the water will be limited. Organizers recommend fans catch the action from the shore. 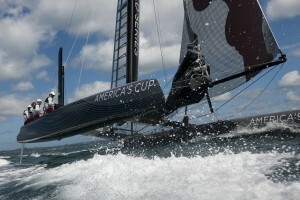 America's Cup Word Series will race off Coronado. 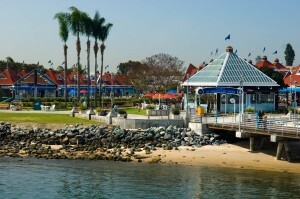 Coronado Ferry Landing, a charming outdoor shopping and entertainment complex located within binocular view of the southernmost part of the race route, is a great way to start the racing day. Grab a quick bite to eat at one of the seven restaurants and do a little shopping before the races ramp up at 1:00 p.m. on Saturday and Sunday. 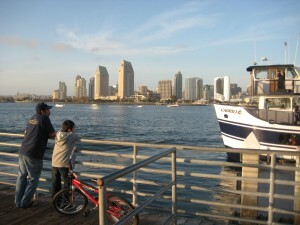 Ferry departs for downtown from Coronado Ferry Landing. After lunch, head out to the Ferry Landing dock to catch a roundtrip ferry ride (just $8.50 per person) to the Broadway Pier or 5th Avenue Landing in downtown San Diego. This may be one of the best ways to see the races from the water! Check out the ferry schedule. Bring a pair of binoculars to zoom in on the boats as they race for the finish line. Terrific bay views from Centennial Park. 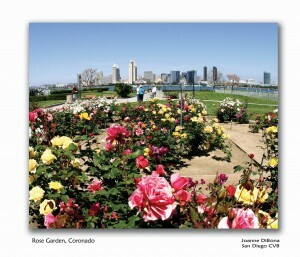 Upon your return to the Coronado Ferry Landing, head north up First Street to one of three beautiful bay front parks: Centennial Park, SDG&E Park or Shoreline Park. From here you can continue to catch the boats racing round the route’s southern loop. The bayside of Coronado’s NAS North Island, open only to active duty military personnel and their families, will also be a prime spot to see the sailing action up close.